During April you might find that you spend a little time indoors waiting for those spring showers/thunderstorms to stop. Fanciful Ink is here to help curb the boredom by sharing an April Showers Crafting Hour every week this month. Stop by for a little how-to and make good use of your home-bound time. Welcome April! Now that it has stopped snowing and the trees are finally blooming I can start thinking of exposing my extremities again. I should probably throw some of my tights away at the end of this season. Some of them might have large holes. Don’t worry...they are not visible. Ok, exposing extremities. Lets get them nice and soft and shiny again! All that cold air and indoor heat can do a number on your skin in the winter months. To quench and refresh your skin, I bring to you a homemade body scrub! This is the second time I have made this scrub and I really love it.You have so much room to be creative with it and even more opportunities to share with your friends and family. You could even have some friends over and make your own scrubs and have a few laughs while you are at it. I made my first scrub with some of my besties and we kind of loved it. The recipe below is not set in stone. If you like your scrub moister than what I advise below, add more oils. If you would rather the scent be stronger, add more scent. Feel free to add and change. Learn a little bit of aromatherapy and create a scent your body might need here and there. For real, the sky's the limit. I use a 2:1 ratio of coconut oil and granulated sugar. Unrefined coconut oil is going to smell like the coconut...pure coconut oil will not smell and will be hard at room temperature. 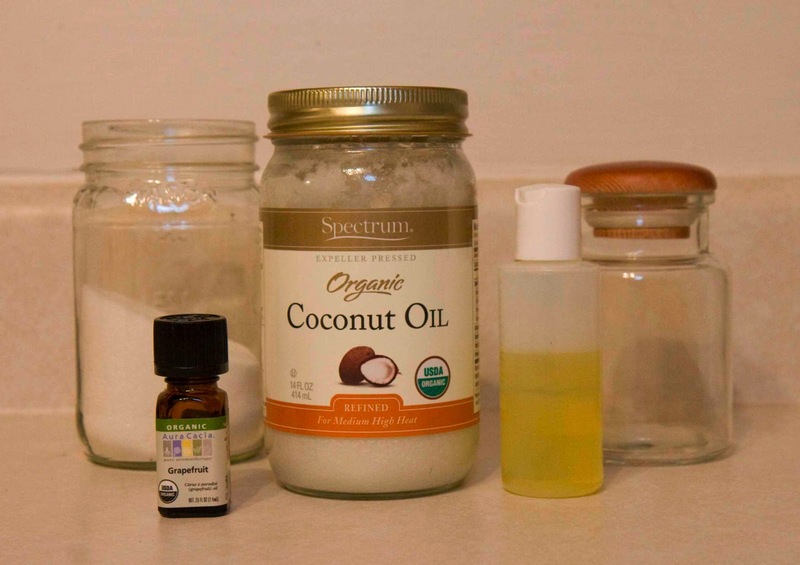 If you are wanting to create your own scent use pure coconut oil and melt it in the microwave (doesn’t take long at all, maybe 30 seconds depending on the amount, heat at 10 second intervals) then add your sugar and mix together. Add your essential oils as desired. Back to a post a few weeks ago...this is a great time to use some Vitamin E oil and heal your skin. I found the coconut and essential oils at local grocery stores that have a large selection of organic products. Earth Fare has a good selection as well as Whole Foods if you have one near you. Our Earth Fare has a lemon and lavender massage oil that I love to use in scrubs. Vanilla (from your baking cabinet) and grapefruit essential oils was a favorite of my girlfriends. Hobby Lobby has some cute glass containers and little scoopers that come with them that are perfect for this craft. Go forth and be shiny! Come on warm weather!